Just a quick warning: the site’s been experiencing some technical issues lately, which may force me to take it down for a short while. If that happens, I expect us to be back no later than Sunday morning. 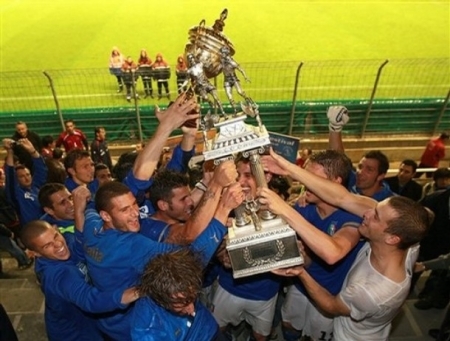 For the first time in the competition’s history, Italy‘s U-23 team has won the Toulon tournament (Festival International Espoirs de Toulon). The Azzurrini, who have succeeded to 4-time consecutive (and 11-time total) winners France as tourney champions, overcame their opponents Chile with a 70th minute goal by Fiorentina striker Pablo Daniel Osvaldo. The Viola player has evidently taken the habit of scoring vital goals lately, and following his Champions-league-qualifying bicycle kick vs. Torino, his sliding strike propelled the Azzurrini to glory. What better morale booster for Casiraghi’s youngsters, in light of the upcoming Olympic games in August huh? In spite of the water-drenched pitch (courtesy of Southern France’s heavy rain day), the majority of today’s game offensives were to the benefit of Italy. Italian manager Pierluigi Casiraghi had fielded his team in their traditional 4-3-2-1 formation, with the Sebastian Giovinco-Pablo Daniel Osvaldo tandem operating behind lone striker Graziano Pellè. The Azzurrini’s start of the match was sparkling: it only took 3 minutes for Osvaldo to arm his shot and while his first attempt was wide, the second one (minute 11) required the full reflexes of Chilean goalkeeper Cristopher Toselli to keep the ball out. Meanwhile, this may have been a “friendly” tournament but the mood on the field suggested otherwise. Rough challenges, tackles, and mini-brawls became commonplace very early into the match, and Portuguese referee Sousa rapidly had to resort to using his yellow card. Before the half ended, Osvaldo had once again a try from distance but without any luck. 0-0 at the break. In the second period, Chile immediately came knocking on Davide Bassi’s doorstep with a powerful Pedro Morales free-kick, but fortunately the Empoli keeper (who at the end of the match, also received the award for best goalkeeper of the tournament) was vigilant and parried away. Casiraghi then began playing the substitutions game (replacing Galloppa, Cigarini and Giovinco with Guarente, Dessena, and Abate), something which his colleague Marcelo Bielsa couldn’t really afford (the Chileans had only 4 players on the bench, due to various suspensions & injuries which made part of their roster unavailable). The newcomers had an almost immediate effect for the Azzurrini, Daniele Dessena in particular because the Parma midfielder provided the pinpoint through pass for Osvaldo, which the Viola striker slid diagonally into goal leaving Toselli rooted to the spot. 1-0 Italy with about 20 minutes to go. Chile attempted to fight back, but the rainy conditions weren’t exactly helping their technique-oriented playing style. Fabián Orellana had a good chance shortly after Italy’s goal, but the biggest hair-pulling moment for the Chileans came deep into stoppage time, as Gonzalo Jara slammed a powerful long-range drive straight onto Bassi’s post and wide. Before that, Tiberio Guarente had nearly made it 2-0 for Italy following a counter-attack, as he attempted to chip the Chilean goalkeeper from 40 yards and hit the base of the post. 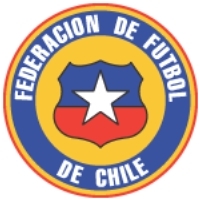 CHILE (3-3-1-3): Toselli – Caroca, Jara, Rebolledo (72’ Sagredo) – Fuenzalida, Meneses, Corvetto – Morales – Orellana, Lorca, Villanueva. (bench: Olivares, Martinez, Vargas). Coach: Bielsa. Since it’s May 28 and all the Euro 2008 rosters have been finalized, let’s take a look at Italy’s biggest rivals from Group C. It may be called the “Group of Death”, but I am talking of course about France. Coach Raymond Domenech had already made a “Pre-selection” list of 30 players some weeks ago, eventually cutting down the group to the required 23 imposed by UEFA. Much like World Cup 2006 (which saw the surprise call-ups of Franck Ribéry and Pascal Chimbonda) there were a few surprises in the list, in particular regarding the absentees. 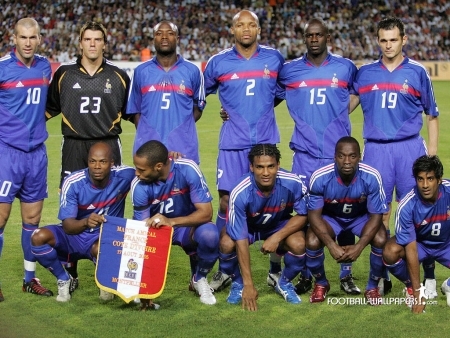 For example, Mickaël Landreau and Djibril Cissé had extensively featured on Les Bleus‘s roster since the World Cup but instead, the French coach chose to privilege and reward the recent form of Steve Mandanda (keeper for Marseille) and Bafetimbi Gomis (striker for St. Etienne). Les Verts‘s forward had surprised everyone this Tuesday, by scoring the two victory goals in France’s friendly encounter vs. Ecuador (one better than the other, the second of which a spectacular scissor-kick). 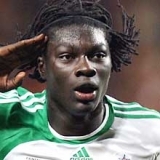 Cissé must be really fuming though, because he hasn’t played in a major tournament since World Cup 2002 (he was suspended in 2004 and injured in 2006). In defense, the biggest surprise comes from the absence of Julien Escudé, a pillar of FC Sevilla’s and France’s backline in recent years (it seems however that the French center-back “re-awakened” his hernia (pubalgia) problems on Tuesday and was thus excluded for health/fitness reasons), as well as that of for Philippe Mexès (considered by many as one of Serie A’s best defenders this year). The latter just further demonstrates my theory that Domenech has an absolute phobia for anything coming from Italy, biggest case in point being David Trezeguet‘s (20 goals in Serie A this season, one goal behind topscorer Del Piero) absence even from the “Pre-Selection” list. One really has to wonder how on Earth Sebastien Frey didn’t get the cut. Finally, Jérémy Toulalan and Lassana Diarra were preferred over Mathieu Flamini and Alou Diarra (Flamini just signed for AC Milan… you see how proving my theory just gets easier and easier? ), while Hatem Ben Arfa was discarded due to his limited use in Lyon’s line-up this year. French sports newspaper L’Équipe suggests that by choosing 4 main strikers (Henry, Anelka, Benzema, Gomis) in his roster, Raymond Domenech is determined to keep utilizing his tested 4-4-2 formation for the SwissAustria tournament. 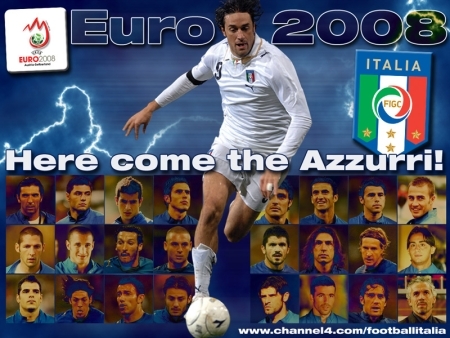 In accordance to the UEFA-imposed May 28 deadline, Italian coach Roberto Donadoni has made his final roster selection for Euro 2008: the 23 players who will representing the Azzurri this Summer have been picked and as many expected, Fiorentina midfielder Riccardo Montolivo was the player discarded from the manager’s Pre-selection list. “I was expecting it, I’m not too disappointed” said Montolivo. “The coach told me I had been excluded from the roster, and we’ll discuss the possibility of me staying among the group until Friday, and perhaps participating in the friendly vs. Belgium in Florence“. 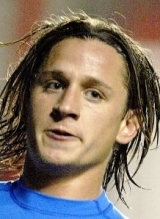 Donadoni himself however revealed, later in the day, that Montolivo would be leaving Coverciano. “The choice has been made yesterday evening. I gave [Montolivo] the choice of remaining with us, and he decided to leave tonight“. 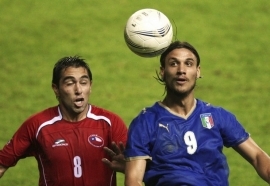 It’s worth mentioning that Montolivo was, until the last minute, in serious contention with Quagliarella. It isn’t a coincidence that in the official team picture, both Montolivo and Quagliarella appear on the far ends of the second and bottom rows respectively (i.e. in easy “position” to be cut out). The same situation had taken place for Euro 2000 and Giuseppe Pancaro, who was then discarded at the last minute by then-coach Dino Zoff. Also, many (myself included) had expected the Don to make his final choice between Montolivo and Aquilani (who was struggling with form & playing time in the last part of the season), but I guess Donadoni was reassured by the performances of the Roma player during practice, and reverted his final choice to Montolivo/Quagliarella (the Udinese striker also had a bleak end of the season, compared to his usual abilities). In addition, the final shirt numbers have been submitted to UEFA. De Rossi has inherited Totti’s nº10, Del Piero will be keeping nº7, and Cassano wil take nº18 (formerly Pippo Inzaghi’s). In an exciting Roma-Inter Coppa Italia final (reaching its 4th match-up in consecutive years), the Giallorossi grabbed their season consolation prize. I say “bittersweet” in the title and that deserves some explanation. Sweet firstly, because beating one’s big rivals is always great, especially after a season-long head-to-head race in the Serie A and especially if those rivals are Inter. And bitter because… well there’s only so much a Coppa Italia win can compensate. As every Serie A fan will testify, winning the Scudetto’s a whole other ballpark and for Roma, that will have to wait another year. Saturday’s evening began with the national anthem, in honour of Italy’s president Giorgio Napolitano who was present in the stands. The notes of the “Inno di Mameli” could hardly be heard however, as the Stadio Olimpico cauldron (Roma’s Curva Sud especially, timidly imitated by the few Nerazzurri supporters) roamed with Giallorossi cheers. Attention then shifted to the pitch, with Roma showing their winning intentions straight away. Simone Perrotta forced Nicolas Burdisso to clear the ball off the line (though there was a clear offside call), then tried a fierce shot on the volley (saved). He was shortly imitated by Mirko Vucinic, who just failed to clear the wall from a free-kick: all in the first 6 minutes. Inter reacted according to the script: they made every effort to slow down the pace, working hard and trying long balls towards David Suazo and Mario Balotelli, the Nerazzurri “speed tandem” in absence of Zlatan Ibrahimovic (once again injured). The pair managed to get a few shots on goal, and was supported in their efforts by Maxwell, who forced Doni into a low save in minute 13. As for Roma, Spalletti’s men were also forced (surprisingly) to abandon their usual playing style at times, resorting to long balls towards lone target man Vucinic. Despite this tactical change chances for the Giallorossi flourished, as in the 15th minute mark when Ludovic Giuly shot high over the bar from an excellent position inside the area. As the minutes passed, Inter defended well, with Burdisso in great form, and slowly they managed to gain ground. Mid-way through the first half came a good header from Balotelli which grazed the crossbar, then Maxwell’s great shot that Doni was forced to deflect into corner. At this point, though, Roma woke up again: partly because these two chances had rung the alarm bell, and partly because Inter were now more open and the Giallorossi were able to play their more attractive game (rapid counterattacks coupled with short passing on the ground). New chances thus developed for Vucinic and Perrotta, peaking with Philippe Mexes‘s goal in minute 35: the French center-back burst forward like a true striker to meet David Pizarro’s corner, and knocked the ball in with a powerful right-footed volley. 1-0 Roma. After conceding their goal, the Inter defense disintegrated: no longer impeccable as it had been at the start (partly thanks to the movement of Vucinic and Perrotta who often swapped positions, supported by the effective Pizarro-Aquilani axis), the Nerazzurri risked going down by two as Mexès once again came close to net with a narrowly wide header. 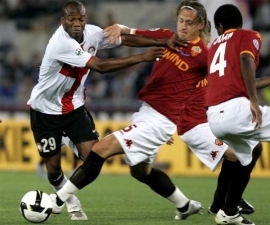 The half ended with the Giallorossi deservedly ahead by one goal. In the second period, Roma picked up where they had left off: attacking forward. Perrotta tried his luck by foot and by header, followed by Vucinic (shooting wide with Aquilani free in space). On the other side, Inter coach Roberto Mancini decided to insert Pelé on in place of Dejan Stankovic (seemingly very edgy). The substitution didn’t exactly have the desired effect: Vucinic immediately made amends for his missed pass to Aquilani, and exchanged passes with Simone Perrotta on the edge of the Inter box, allowing the Roma midfielder to tap into the empty net 8 minutes after the restart. 2-0 Roma. Just 6 minutes later however, Pelé got to work. The Nerazzurro prodigy showed what he was made of, and executed a spectacular shot from outside the area that left Roma keeper Doni rooted to the spot. 2-1. Now Inter believed. Mancini pumped up the quality of his team by inserting Luis Jimenez, and Burdisso – doing no less than Mexès – showed off with a diving header that only the woodwork denied (Doni was beatedn). For Roma the game had changed: Spalletti’s men could no longer simply enjoy themselves: it was time to produce hard work and endurance. The remaining 20 minutes were all nerves, yellow cards, cramps and injuries: football in its spectacular sense vanished. Injury time extended to 6 minutes, a while during which Burdisso once again grabbed the spotlight, with a dangerous volley on the turn (wide). The fact that shooting tasks always seemed to fall to him was however quite indicative: Inter forwards were no longer in the game. Eventually, the referee called full time thus allowing the Coppa Italia to stay in Rome. 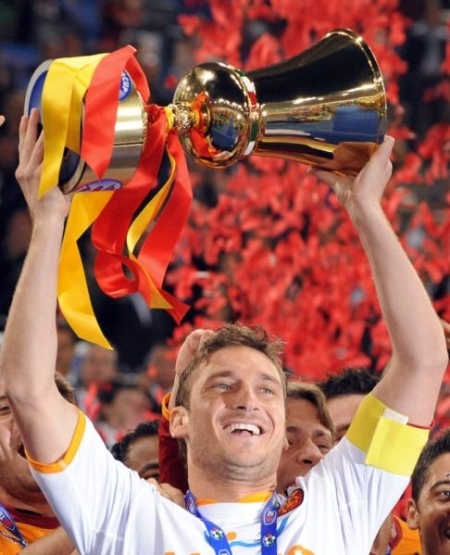 Passion and hard work was the succesful recipe for the Giallorossi on Saturday, something that Roma’s nº10 (a certain Francesco Totti, who came out onto the pitch to celebrate and hoist the cup) is no stranger to. ROMA (4-2-3-1): Doni – Cassetti, Juan, Mexès, Tonetto – De Rossi, D.Pizarro – Giuly (65’ Cicinho), Aquilani (91’ Panucci), Perrotta (74’ Brighi) – Vucinic. (bench: Curci, Antunes, M.Esposito, Mançini). Coach: Spalletti. INTER (4-1-4-1): Toldo – Maicon, Burdisso, Chivu, Maxwell – J.Zanetti (89’ Crespo) – Balotelli, Vieira, Cesar (61’ Jiménez), Stankovic (46’ Pelé) – Suazo. (bench: Julio Cesar, Solari, Maniche, Fatic). Coach: R.Mancini.